In the cool Minnesota Summer of '09, it was rare to see monarchs fluttering about. This photo was taken at the beginning of September when most of the monarchs had already started their premature winter migration. To see 4 monarchs at one time was a testament to the magnetism of this flower! 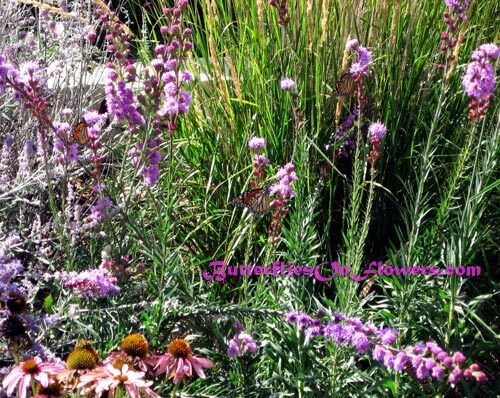 The year before I saw Liatris ligulistylis plants in a front yard garden that must have had two dozen monarchs...one of the most magical monarch moments of my life! Butterfly facts: How come monarchs go bat crazy over Liatris ligulistylis and not other liatris species? According to Dr. Tom Barnes from the University of Kentucky, this particular species emits an odor this is irresistible to the monarchs.